Whitening is a great way to brighten up your teeth to give your smile that extra sparkle. It can be used to lighten all of your teeth or even just one darker tooth. It’s a fantastic way to change your smile. After traumatising one of her front teeth, Naomi found her tooth went grey. 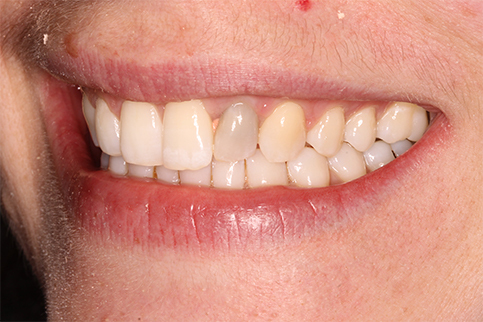 Using whitening, we were able to brighten the tooth back to normal while not removing any existing enamel. As a result of having root canal treatment on one of my front teeth, I was left with a grey tooth that I was very self-conscious about, especially when talking to people or smiling. 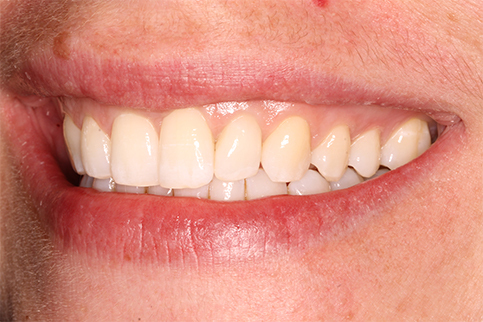 I decided to get it treated, and I couldn’t be happier with the treatment I received from Dr. Wilson and his team. I had all of the treatment options explained thoroughly and clearly so that I could make an informed decision about what to choose. I felt extremely confident in Dr. Wilson’s professional judgement about which treatment was most appropriate, in this case bleaching the tooth, and left the initial appointment feeling reassured in my choice. The following appointments in which my tooth was treated ran smoothly, and throughout, Dr. Wilson ensured I was aware of what was being done and most importantly, he spent a lot of time ensuring I was confident in how to use the bleaching kit at home. The end result of the treatment is fantastic, I am delighted with it. I have no hesitation in recommending the services of Dr. Wilson.